A mini-park and children’s playground, can be found on the first hill providing more choices to tourists to enjoy their stay while being greeted with a cool atmosphere. 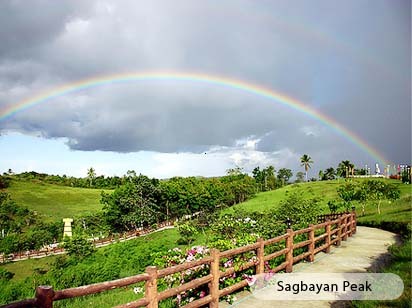 A butterfly sanctuary, tarsier cage and statues of famous animated characters and prehistoric creatures are additional features that can be found scattered on specific areas. You can also get a much closer view of the surrounding mounds. The second hill has a rotunda on top of it where one can get a good view of neighbouring hills. A dance party is usually held on this area every Saturday especially for young people. At a bird’s eye view, this attraction is a park built on top of two hills.